﻿ Best touchless keyboards for carpal tunnel syndrome, arthritis hands, RSI, tendonitis, and etc. "I've used it for a week now. My hands don't feel as tired and painful as before after work. Hope my RSI can recover from now on. Thanks a million for your wonderful product and the ergo tips on your website." "I have carpal tunnel syndrome and I've come to rely on it. I would like to buy a spare..."
$159.00 (include shipping), can return for refund with no reason in 60 days! You can also buy from amazon.com. The best kwyboard for carpal tunnel syndrome! Specifically designed to ease the pressure on wrists, force on hands, and the strain on body. This new and unique Ergonomic Touchless Keyboard replaces push-button keys with optical sensors to avoid the forces on fingers and pressure on wrists. It is ergonomically designed to protect health and enhance performance. Used properly, it can avoid most, if not all, keyboarding related pains and repetitive strain injuries and also improve productivity for computer users. It's best for people with carpal tunnel syndrome, arthritis, or other body conditions and injuries to resume productivity without pain. It's also good for people who want to increase their typing speed and be easy on their fingers, hands, wrists, and shoulders. removes all major causes of typing stress and pain." What's the exact cause of the pain of typing, really? 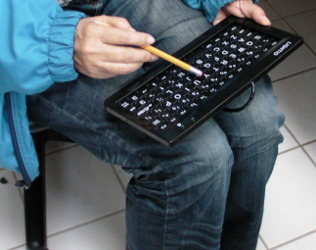 Video demo: Hands with arthritis can type fast without pain. How to use flexible postures to reduce the stress and avoid the pain on your wrists and shoulders? Video demo: The most comfortable posture? The "back and shoulder dilemma", and how to use changeable postures to bring relief to both? Appendix A: How to test drive before you buy? Typing can be painful. If you have arthritis in hands, carpal tunnel syndrome, or tendonitis in upper limbs, then you have experienced unbearable pain pounding on keys. Actually, pain from typing is a widely spread problem today even for people with no chronic illness. But what's wrong with the keyboard that gives you so much pain? To provide an effective solution to this problem, we need to trace to the scientific fundamentals of exactly how pain happens. In the authoritative book of pain medicine, Wall and Melzack's Textbook of Pain, scientists explains that body pain is "a neural response to noxious (injurious or potentially injurious) stimuli, and thus provides a signal to alert the organism of potential injury." So it's the injury related stimuli cause all the pain. Now let's look at what stimulates you in a typing activity. When you perform a key stroke, your finger tip first hits a surface of a key, the initial stimuli comprise of a collision. When you press the key down, the resistance of the key applies a force on your finger and form the second stimuli. When the key reaches the bottom and stop, the third stimuli in the form of a collision happens. When the key rebounds, your finger also lifts, so not much stimuli there. Thus the pain of typing most directly comes from pressing down the keys. You can test it by just laying your arthritis hands on the keyboard relaxed without using any force, you will not feel any pain. If you just move your arthritis hands gently in the air, you won't feel any pain either. It's the forceful pushing keys that bring up the pain in the hand with arthritis. But these stimuli don't end in fingers. 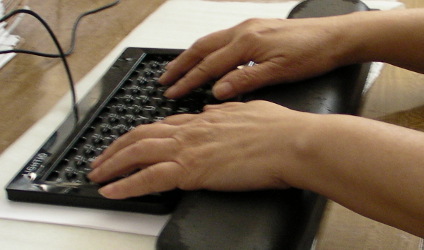 The typing activity exerts force on body tissues that are connected to fingers, such as wrists, elbow, and all the way to shoulders. The stimuli also propagate along connected tissues, muscles, and nerves. If injured, inflamed, or damaged tissues receive forced stimuli, enhanced sensation of pain is produced to report such noxious stimuli to the central nervous system. And any where in your upper limbs that have injury or potential injury will feel the pain from the finger tip action of pressing down a key. After a decade of research and development, utilizing the latest optoelectronics technology, the team of LIGHTIO, comprised of some top notch scientists, engineers, and designers, finally come up with a device that not only solves nearly all the pain and ergonomic issues of the keyboard, but also provide improved speed and productivity for hands with arthritis, as well as normal hand. There are 2 infrared light beams pass above each key label in a cross. A key stroke is performed when both beams are blocked. Each key is surrounded by raised walls that have slits to let light beams pass. The key surface is below the frame and the raised walls around keys. 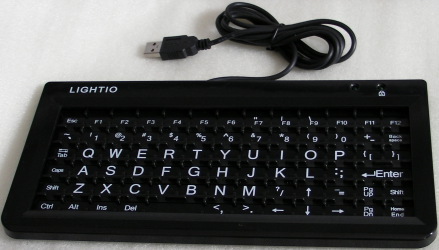 The size of the keys as well as the keypad are comfortable for use by one or both hands. The weight is light enough to carry by one hand in various positions. How these features avoid pain and injuries, and bring ergonomic benefits and productivity gain will be discussed in detail in the following sections. You can use a bendy straw to type. You won't feel any hitting force on your arthritis finger or bending pressure of the wrist. You can move the bendy straw as fast as you like without causing unintended key hits. The head of the bendy straw needs to be opaque. In this demo, a black tape is wrapped around the head of the bendy straw to block the light and also protect the straw so it can last a long time. There are two crossing beams of light above each key label, in this case infrared beams. When these 2 infrared beams from perpendicular directions are blocked at the same time, a key entry is invoked. This light blocking mechanism eliminates the force on fingers with arthritis. Since the typing pain comes directly from the forceful stimuli of pressing down the button-keys, then the touchless feature of this keyboard comes to the rescue as forceful pressing is no longer needed. Even the lightest touch is not required unless you want to. Instead, the only action of the fingers is just blocking a crossing beams of light, that feels nothing. This means no more hitting forces on your swelling arthritis hands, especially arthritis fingers. Also the force and pressure on your carpal tunnel is significantly reduced. The pain from tendonitis is also much reduced. The work done by fingers is reduced to 0 in the sense of physics. The typing speed for each key is faster. This benefit alone makes this keyboard the best keyboard for people with arthritis in hands, especially arthritis in fingers, tendonitis, carpal tunnel syndrome, and RSI because such hands can now type fast without pain. A missed productivity can be resumed now. Hands with arthritis can type fast without pain too. If you have carpal tunnel syndrome, then you are familiar with typing pain. Actually, the official site of the National Institute of Health (NIH) states that “Typing on a computer keyboard is probably the most common cause of carpal tunnel.” and that "Carpal tunnel syndrome is a condition in which there is pressure on the median nerve". So to avoid the pain from carpal tunnel, and to prevent carpal tunnel syndrome from happening to you, we need to find out how your typing action applies pressure to your wrists, and especially the median nerve inside. By the definition in Physics, pressure is just the force on a unit area. So here the culprit is still the forces on your wrists. Pressing down keys certainly transmits the force from your finger tips to your wrists. By removing the need to pressing down keys, a significant amount of pressure can be avoided. Bending or twisting your wrists involve muscle contraction, 2 obvious sources of force and pressure to your wrists and carpal tunnels. Wrist bending and twisting in any directions also block circulation, and can cause pain and injury when the wrists are bent over an extended period of time. Many people believe that carpal tunnel syndrome is resulted from such bending and twisting. The design of this touchless keyboard take this factor into consideration and make the key surface below the rim of the frame. So your palms don't need to raise above the wrists to apply force to the surface. Especially if you use a keyboard wrist support so that your wrists are much higher than the surface of the keys. Then your wrists can remain flat all the time. Thus the bending of the wrists in the vertical direction is no longer necessary. Your wrists can be flat to avoid bending. The small and thin size of our touchless keyboard make it less necessary to move your hands horizontally to reach keys, and thus reduce the bending of your wrists in horizontal directions. The small size of this touchless keyboard makes it comfortable for you to use one hand to type. 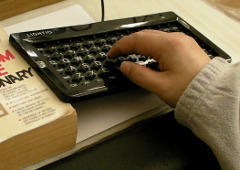 So you can put something, such as a book, under one end of the keyboard and support the surface to be tilted to suite the neutral directing of you wrist and avoid twisting. Since the support is adjustable to any height to make the surface a perfect fit to your personal dimensions, it's more effective in reducing the twisting than some predefined "ergonomic shape" that was designed for the "average" arms. Your wrists can also be in their neutral directions to avoid twisting. The small size of our keyboard also makes it comfortable to use a stick like a bendy straw, or just one hand, and then your wrist can be in neutral directions and avoid any pressure at all. Using a pencil to let your wrists be in their most natural positions to avoid pressure. How to use flexible postures to reduce the stress and avoid the pain on your shoulders? Shoulder pain is one of the most common complained discomfort for computer users. Some can be so severe as to evolve into frozen shoulders. It is generally believed that the shoulder pain is caused by improper postures. The right posture is to sit up tight with shoulder flat and arms naturally dropping straight down. Flat shoulders and straight down arms cause least stress and friction of movement of the hands. However, in reality, such a proper posture for a pain free shoulder is not that easy to achieve. First of all, it takes more energy for your muscles to pull up your body against the gravity from the earth to sit up straight. It can become tiring very soon for most people, especially those with spine and waist illness. To sit straight up tight also puts lost of pressure on the joints of your spine, and is most harmful to your back. More on this issue in the next section about the back pain. 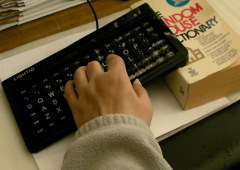 It is also difficult for many computer users to let their arms dropping straight down. This is mainly because most computer users can not adjust their furniture to fit their personal dimensions. Only some very big companies could equip their offices with expensive ergonomic chairs, adjustable keyboard trays, and big enough space to position the monitors properly. It usually costs a few hundred to more than a thousand dollars to "make it right" just for one person. But standard ergonomic furniture and the standard keyboards are usually designed for the dimension of average American white male with about 178 cm in height and corresponding arm length. If you are different fromthe standard size, then some stretch and stress will be needed to make it work. The more different you are from the standard size, the more stress you'll have, and the strain may break you in your weakest tissue. Further more, if you already have shoulder problems, or your spine is naturally tilted like many people, then this "correct posture" won't do you much good. Try to maintain it every time you type will surely hurt you. A better approach is to find a set of natural and comfortable postures for your own body so that you can switch from one to the next every once in a while. At LIGHTIO, we believe that any fixed static posture is a cause of RSI (Repetitive Strain Injury), especially shoulder pain. No matter what posture you like to use, if you keep it for too long, some part of your body will be strained and may lead to pain and injury. The good way is to change your posture from time to time to avid tension development. Even when you are asleep, you still turn from side to side every once in a while. By using flexible postures to suit your own body, you body will naturally avoid tension on your weakest part, but shift tension to different muscle groups from time to time. Then your chance of getting pain and injuries is truly minimized. This touchless keyboard is designed for this purpose by being small and light, and yet it doesn't need strong support for the pressing force. Then your posture can be in many forms as you feel comfortable with, and change at will. This capability makes this touchless ergonomics keyboard the best computer keyboard for preventing not just carpal tunnel syndrome, but also shoulder pain, as well as other types of RSI. Holding this keyboard in one hand, resting it on a lap, make yourself comfortable. Your arms are dropped naturally and supported by your lap so that your shoulders are minimally loaded. This posture avoids a lot of the body strain, especially for the shoulder and wrists. If you don't want to use fingers, use a pencil instead. The back and shoulder dilemma, and how to use changeable postures to bring relief? Actually, low back pain is the number two reason that Americans see their health care providers -- second only to cold and flu. As long as you sit in a chair to do your work all day long, your lower back is taking all the weight and pressure from your upper body for the whole working period. When your low back is constantly under pressure, sooner or later the weakest tissue in that area will be hurting. But the issue is not just with the circulation. Researchers have found that, "When strain is placed on the spine, the spinal disks start to move and become misaligned. At a 90-degree sitting position, this movement was most prominent. The disks were least moved when subjects were sitting back at a 135-degree sitting position." as reported in the media. So the "ideal typing posture" is hurting your back the most! But when you lean back, how are you going to type on a keyboard if your arms are straight down? If you raise your arms and reach forward for your keyboard, then your shoulder is stressed and will hurt soon. This is the so called "Back and Shoulder Dilemma." It seems either your back or your shoulders will hurt no matter which recommended posture you use! No need to worry if you have this touchless keyboard. We've got this issue covered. This keyboard is designed to be so small and light is to let you hold it in various positions. From sitting up-right, to lean back even more than 135-degree, you can use it with ease. When you lean back, you can place it on your lap, or use one hand to hold it higher. You can even type with your feet on the desk and this keyboard on your belly. But what we recommend is to change the angle of your sitting from time to time to avoid the tension at any spot for too long. And this keyboard is designed to support this idea. A major cause of RSI, and carpal tunnel syndrome, is the over use of a muscle group or joint. In the case of carpal tunnel syndrome, it's the bending wrist combined with frequent finger movement that continued too long and harmed the nerve going through the wrist. Many types of hand pain are also caused by over striking of the fingers on keyboard. It took the design team at LIGHTIO more than a year and 3 versions of prototype to finally reach a size that is comfortable for use either one hand only, or both hands. This means your working hand can be switched at any time so that one side of the hands and shoulders can rest and recover while typing continues. The changes of posture from sides have an overall effect on the body. The one-handed open posture also reduces the pressure on your chest. It's better to develop a habit of switching hands to avoid not only the pain and development of carpal tunnel syndrome, but also the pain from the arthritis in hand, arthritis in finger, or other type of hand and body pain. Switching between hands can reduce the fatigue of hands, wrists, and shoulders. Because each key is surrounded by raised walls, you can use multiple fingers to type just like a regular keyboard. The walls actually make it less likely for you to hit unintended keys by mistake than in a regular keyboard. This design brings the input speed of this touchless keyboard on the same level as a regular keyboard. However, other features enable this touchless keyboard to outperform a regular one. The speed gain comes in 4 ways. First, you save the time and work of pushing down keys against a spring or rubber-dome underneath each push-button key. Second, the key strokes respond faster. This is because for push-button keyboards, a software algorithm called "debounce" is implemented to delay each key down response for a fraction of a second to make sure the key contact with the circuit board is stabilized. This time of delay is saved in our touchless keyboard. your fingers can have the same comfort touching the keys, but don't have to move the same distance as a regular keyboard. This save time and energy for your fingers, especially good for hands with swelling joints. The fourth reason is that because the work and pain level are reduced using this keyboard, you are likely to type more in the same period of working time. These performance issues may not matter much for a regular person. But for someone with carpal tunnel syndrome, arthritis in hand, or arthritis in finger, the speed gain may mean not fall behind too much in productivity. It may also mean the suffering from hand pain is shortened. For people who play computer games, the key stroke speed may mean life or death of a virtual character. To really boost your typing speed to a new level, you might want to consider using 2 keyboards, one hand each, at the same time. Because the size of this keyboard is comfortable for use with one hand too, use each hand for part of the whole key area, and when one finger is close to the next input key with a moving momentum, it can just go without switching hands. This configuration not only reduce the pressure on chest and shoulders, but also make input faster. So this keyboard not only avoids pain and injuries to many of your body parts, but also improve your productivity by saving labor of your fingers and increasing your typing speed. Considering the medical cost and lost productivity and opportunity, it offers a lot more value than the price you pay for. If you order now, you not only can bring an end to the pain of your typing experience, but can also stop further development of your disease to a certain extent. It's better to take action early before giving people a bad impression of being incapable of doing work, or even become truly disabled and have to change career like so many RSI patients did. Save your fingers some work, avoid pain and injuries with 60-day money back guarantee! To buy more, please use our Web Store. You can also buy from amazon.com. If typing causes you pain, but you think this keyboard is too expensive for you, or you are afraid that it may not work out for your case, you can turn to your library for help. You can suggest them to buy one and use it there. They usually will agree to acquire one for the disabled to use inside the library. "Providing equitable access for persons with disabilities to library facilities and services is required by Section 504 of the Rehabilitation Act of 1973, applicable state and local statutes and the Americans with Disabilities Act of 1990 (ADA)." Most libraries have one or two computer stations for people with disabilities, often called ADA computers. They are often equipped with magnifiers or keyboards with large keys for the vision impaired, or alternative mice for injured hands. Since our keyboard is so new, most of them don't know about us. Library Services for People with Disabilities Policy on their site. Especially, "Libraries should work with people with disabilities, agencies, organizations and vendors to integrate assistive technology into their facilities and services to meet the needs of people with a broad range of disabilities..." "Library staff should be aware of how available technologies address disabilities and know how to assist all users with library technology." If you want your library to equip a touchless keyboard, you can make a request to them first. Many libraries have specific forms or email addresses for their users to make requests regarding the senior and disability support. Most librarians are sympathetic and supportive to people in painful needs. However, if you feel uncomfortable talking to them about your pain, or they ignore you, you are welcome to send us your name and your library's website address, and our sales representatives will work on your behalf to approach them.